The ABX-Two has a powerful real-time kinematic (RTK) engine that delivers centimeter-level accuracy from a base station or RTK network, according to the company. With Trimble RTX™ correction services, the ABX-Two achieves Precise Point Positioning without a base station. The ABX-Two features a wide range of option-upgradable GNSS configurations from single sensor/single frequency/single GNSS to multi sensor/multi frequency/multi GNSS capability. 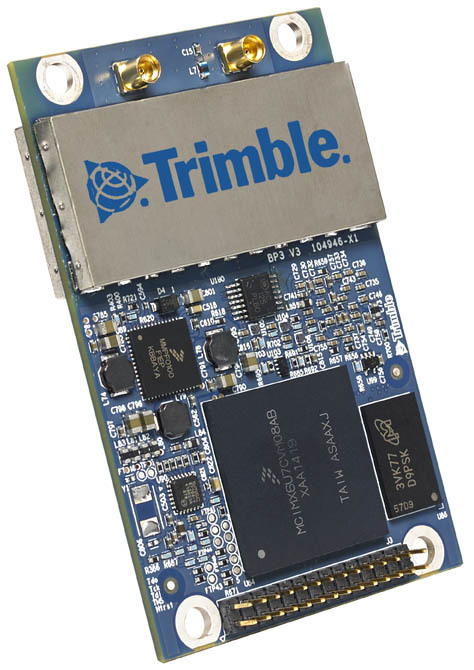 Trimble’s patented Z-Blade technology drives a GNSS agnostic engine, allowing the ABX-Two to use any single GNSS satellite system for positioning without any constellation preference to deliver fast and stable centimeter-accurate positioning and heading information. The sensor uses two interconnected MB-two boards. The same GNSS engine is implemented in each of the two boards. The GNSS engine features 240 tracking Channels; two tightly coupled, all-in-view GNSS sensors delivering simultaneously: GPS L1+L2, QZSS L1+L2, BeiDou B1+B2, GLONASS G1+G2, Galileo E1+E5b, SBAS L1.